You know what’s faster than 30 minute meals? Left overs from 30 minute meals. At Trader Joes or essentially any super market, you can find those refrigerated pastas like ravioli and tortellini . I was always put off by the price point, but then I turns out to be quite the value. We usually pick up to packs during our weekly bro shopping. There are several different types, I avoid any “meat” tortellini and just go straight for the spinach and cheese or brie tortellini. Here’s the trick, I don’t just dump pasta sauce after I cook them, I think about in terms of stir fry. I first cook the pasta al dente, drain and reserve a cup of pasta water. Then I start saute-ing any veggies I have in the fridge with different herbs; I love zucchini, baby spinach , fresh tomatoes, onions, and mushrooms and whatever combination. Oh and you have to have garlic. Then I add any leftover meats I have like chunks of chicken or pork. Then I just toss it around and then add the pasta. The sauce here is just a marinara sauce boosted with some herb de Provence and some eggplant and Enoki Mushrooms, which is a cool stringy Japanese mushroom. I put in enough sauce to generously coat but not drown the pasta. They can’t swim. Sometimes, I don’t even put tomato sauce. I once made a gravy sauce and tossed the pasta with that. It was basically a cream sauce heavy on the stock, but it turned out great! And since it’s pasta, don’t forget the cheese, any cheese that goes well with what you put in. This is just a quick reminder that you can do a lot in 30 minutes , so don’t settle for going out all the time! 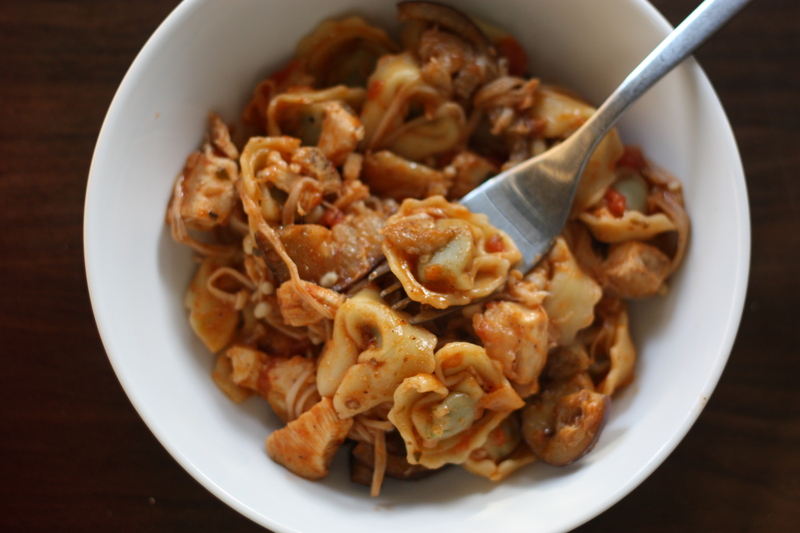 This entry was posted on May 19, 2012 by rrfoods in Lunch, Pasta and tagged lunch, quick nom, tortellini.